A reverse directory is a means of searching for businesses or people when only a phone number or address is known. 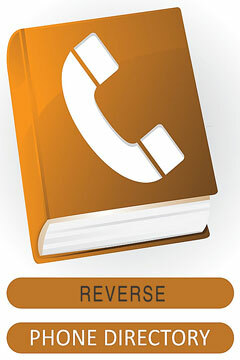 Until the advent of computers and the Internet, reverse directories were often published by telephone companies, either at the end of the regular phone directory or as a separate directory book. Some public libraries have such phone directories in their collections but today most reverse lookups are done on the Internet or using CD-ROM telephone number databases. The concept has also been extended to reverse email directories where you may search for people, knowing only their email addresses. Reverse phone directories are convenient tools that are frequently used by genealogists and law enforcement agencies as well as by the general public. Although reverse directory usage may be illegal in some countries, their use is perfectly legal in the United States. Names and addresses for most listed landline phone numbers are usually available through reverse search directories, but information about unlisted, wireless, and satellite phone numbers may not be available through a reverse phone number search. Bear in mind that individual telephone company directories may only have listings for their own business and residential customers, so be sure to check several reverse directories, as necessary, to find the name or address you are looking for. InfoUSA.com aggregates information about 14 million businesses and 210 million consumers in a single database, and their data are used by several Internet directory services. ReverseDirectory.us features convenient access to several popular online reverse directories as well as a commercial reverse lookup service. Intelius Reverse Phone Search enables you to enter a United States phone number to find a person or business. Whitepages.com reverse phone number searches can find regular phone numbers, toll-free numbers, and mnemonic telephone numbers. This service can also be used to find published listings associated with a street name and city or a specific address. 411.com offers reverse directory services and solutions to clients ranging from Fortune 500 companies to locally-owned businesses.